Equestria Daily - MLP Stuff! 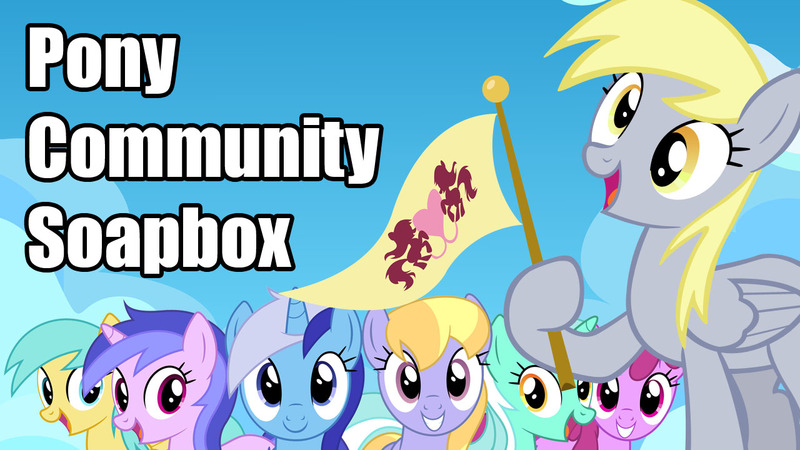 : Pony Community Soapbox #133 - Equestria GUYS, Cozy and Tirek Friendship, Supporting SFW Artists, and More! There is a growing sentiment among the artistic community that you can't make it far with only SFW art these days. A lot of NSFW artists have become really successful with Patreon and other methods while regular artists see half as much interest in their work and struggle to ever turn it into a thing that supports them. I know a few people that draw explicit pony art and hate doing it, but it's the only thing people will pay for and it is much more popular. It always saddens me to see their YCH posts ignored while a clop artist throw up something of half the quality and sell it for $200. Please consider supporting regular artists too. Many fans like viewing Cozy Glow as a sociopathic monster, while completely ignoring the fact that we know nothing about her background. And, of course, all people really talk about when it comes to Tirek is his fight with Twilight in the S4 finale. But, more interesting to me, is what made them how they are. For Tirek, we know that he was betrayed by his (presumably very close beforehand) brother in his first attempt to take over. As a conjecture, I think this connects to his treatment of Discord, his brother allied/befriended him until trouble came, and then used betrayal and alliance with the ponies to his advantage; the lesson I feel Tirek learned was that faking friendship with someone and using them only until a better opportunity comes along is a good strategy, and then he practiced this with Discord. As for Cozy Glow, well, we know very, very little. She was sent to the Friendship School, presumably because of problems making or understanding friends, and fairly soon thereafter decided to align with the monster Tirek. Why? We don't know, since her answers convey little other than that she thinks friendship is powerful, which it is, especially in Equestria. But, in my view, she did make a legitimate connection with the CMC in Marks for Effort, so she was learning; perhaps she took two truths and combined them in a bizzare way: 1) Friendship is Powerful & 2) Tirek is Powerful. Therefore friendship with Tirek would be very strong and very powerful. Now, imagine that Tirek lied about simply being bored and wanted to help Cozy because he desired a connection with someone again; wouldn't it be grand that Cozy got the very powerful friend she wanted (and a true understanding of friendship) and Tirek got a second chance at a close, legitimate connection to replace his brother in the course of saving the world? I think it would. And it would teach that a helping hand of friendship can help even the darkest of souls (Tirek). Sometimes, FIM has those implication/meta episodes like Fame and Misfortune, and Slice of Life, and I'm wondering if the series finale is gonna be the same way? There's rumor saying that after the season 9 finale, the series finale is gonna be a special right after, coming around the holidays! But like I said: RUMOR. Let's say this special happens, and it's about one of the main characters having to leave Ponyville because they must for an important reason, which also implies the end of the show? Now this brings me back to Spike again (oh no, not another Spike theory!). I'm not sure what his character is leading to, but I do know his character arc is missing something important. So why do I think HE's the one leaving? Well, his biggest fear is Twilight abandoning him, even though Twilight claims to never happen, and he IS growing up! As Twilight said in Molt Down, "whatever else happens, we'll get through it together!". Let's say some far-off land is in need of a friendship advisor which would involve one of the Mane 7 having to move to fulfill this role, and can't come back for many years? Then Spike would volunteer cause he knows Equestria NEEDS the Mane 6. This would be hard for his friends to accept, including some of us, but Spike is willing to make sacrifices like this, as seen in Gauntlet of Fire. He's learned so much from his friends, and could be willing to go off on his own to teach others the same lessons they taught him! And that could be the destiny that his character description claims he has! Then when his job is done, he returns home! Maybe he might not go alone, maybe Smolder might go with him - I know the Mane 6 can't, and Starlight would probably take over his assistant role! It could be her going instead, but Spike would leave a bigger impact than her as he's been around since the beginning! Basically the moral here is "goodbye for now, but no matter what happens, our friendship will last forever, and I will return someday", and that's basically referencing G5! Iunno if this is actually it, but it sounds like a likely ending! #1. Tie up as many loose ends as possible. #2. Give any remaining minor antagonists (i.e. Lightning Dust, Flim and Flam, Garble etc.) one last chance to redeem themselves or otherwise face the consequences of their actions throughout the series. #3. Give Diamond Tiara and Silver Spoon one last major role with the Cutie Mark Crusaders. #4. Big Mac and Sugar Belle officially get married. #5. We get to see at least one known location in Equestria that hasn't been shown on screen yet. #6. Give us Spike's real parents, proper origin story, and whether or not he gets together with Rarity in the end. #7. Trixie meets her dad, Jack Pot. #8. Use that cover from the latest trailer in the series finale. #9. Close the same book at the beginning of the series as the last shot before the final credits. Feel free to share your hopes for Season 9 in the comments! Flash Sentry. Timber Spruce. Micro Chips. All of these male characters are featured in My little Pony Equestria Girls. Yet for all of their appearances in the series, they don't get many short films featuring them or any other guys. Only "A Banner Day" and Micro's ending in "All the World's Off Stage" seem like the real legit male centered stories. I know that the series is Equestria "GIRLS" don't get me wrong. Girls should be the focus, our heroes included. Still, it would really cool to see some of the guys do their own interests and hobbies. We haven't seen Flash Sentry with a guitar since "Best Trends Forever." What's Timber up to since the post "Forgotten Friendship" shorts? I'd like to see Sandalwood or one of the placeholder guys get their turn in the spotlight, maybe have them try to attempt to court some of the girls, like in the shots with Lyra, Bon-Bon, and the two guys in "Coinky-Dink World." That seems just as entertaining as stories with the Rainbooms. Unfortunately, I think Allspark Animation and DHX Media won't give us these any time in the near future. But hey, I can still dream.